As BaselWorld 2014 progresses through the rest of this week, Breitling continues its dedication to the aviation and automotive industries. Included in the list of new releases is a tribute to the flagship Chronomat model; which, over the last 30 years, has become a staple in the cockpit. 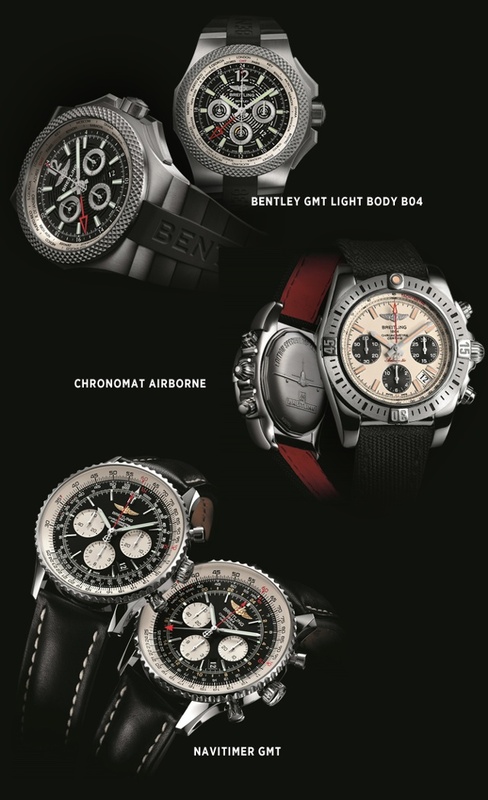 Other reinterpretations include the brand’s famous Navitimer model as well as yet another collaboration with luxury automobile brand, Bentley. The Bentley GMT Light Body B04 is as comfortable on the road, as it is in the air. The 49mm featherweight titanium case houses a Breitling caliber BO4 movement. The dial features an open-worked circular pattern, and displays a 24-hour second timezone, one fourth of a second chronograph, 30-minute totalizer and 12-hour totalizer as well as calendar. Its rotating pinion bezel with timezone scale was inspired by Bentley’s signature radiator grilles and the asymmetrical lugs and black rubber strap increase its ergonomically streamlined profile. Thirty years ago, Breitling introduced what is still a principal in the brand’s collection; the Chronomat. This week the manufacture released its celebratory Chronomat model, the Chronomat Airborne. Originally developed in collaboration with the Italian Air force Aerobatics team, the Chronomat quickly became a reference in the field of pilot’s instruments. The Chronomat Airnborne is powered by Breitling’s Caliber 01 movement, a self-winding, high frequency mechanism. Its functions include a one fourth of a second chronograph, 30-minute totalizer, 12-hour totalizer and calendar. The over 70-hour power reserve increases its utility to the pilot and the unidirectional, ratcheted and rotating bezel allow easier access with gloved hands. The Navitimer collection grew this week as well. Two new models grace the over 60-year old collection; the Navitimer 46mm and the Navitimer GMT. In a new size, the Navitimer 46mm has optimized its readability. A Breitling caliber 01 movement powers the timepiece that is limited to 200-pieces. In steel or red gold, the case is adorned with circular slide ruled rotating bezel that frames a black or blue dial. The Navitimer GMT was created with the traveler in mind. Powered by Breitling’s caliber B04 movement, the dual timezone functionality is controlled through a crown of which, when pulled and turned forward or backward, enables an instant setting while maintaining home-time. In steel or red gold, the case measures 48mm in diameter and frames a black or silver dial.